Age related retinoschisis is a degenerative process occurring in the retina, beginning at the inner front part of the eye nearest the iris. This area slowly enlarges becoming filled with a viscous (thick) substance, filling up like a balloon. This process advances until the involved retina is completely separated into two degenerated layers, severing the neuronal elements and resulting in complete and permanent loss of all visual function in the involved area (i.e. a blind spot). Degenerative retinoschisis has a prevalence of 3.7% among patients over age 10, and of 7% among those over 40 years of age. Two forms have been described. One form designated flat (or typical) was thought to be a milder form, versus the other form designated bullous (or reticular, balloon-like), thought to be more severe. It is, however, impossible to differentiate these types of lesions into these categories reliably. Clinically, degenerative retinoschisis usually presents as a peripheral, smoothly elevated lesion, with a uniformly convex posterior border. 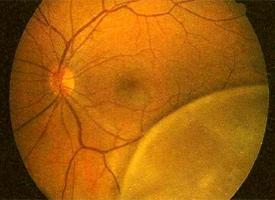 It appears as a “water blister” on the retina. The surface of the lesion may show whitened blood vessels, or areas of small whitish flecks called Gunn’s dots. Retinal breaks, as seen in the above photograph, may eventually appear in the outer layer in around 15% of involved patients. Breaks in the outer layer may be of any size, but frequently are huge, and are usually seen to have a prominent whitish rolled border. It has been long known that these retinal breaks occur in as many as 11% of affected eyes and may be associated with retinal detachment. It has been reported that a schisis-detachment occurs in around 8% of patients with retinoschisis, as opposed to the frequency of retinal detachment in the natural population of 0.05% (or 1 in 2000) patients. In almost all cases of degenerative retinoschisis (at least 99%), the disease produces no symptoms. Therefore, most existing cases are never discovered. Its presence usually comes to light only when the patient consults their optometrist because of other symptoms, such as those related to a posterior vitreous detachment (PVD). Actual progression of the retinoschisis to involve the macula is exceedingly rare. Patients with retinoschisis should be followed every 6 to 12 months if no symptoms are reported. However, they should be examined promptly if any change is noted. Patients with retinoschisis should be educated about the signs and symptoms of retinal detachment. Patients need to understand that delaying the reporting of the sudden appearance of flashes of light, floaters, sparkles of light, or shadows, can seriously increase the risk of permanent vision decrease or loss. Treatment of retinoschisis should only be considered in cases of symptomatic, progressive retinal detachment. It has never been shown that prophylactic treatment statistically preserves vision or prevents complications in cases of degenerative retinoschisis.